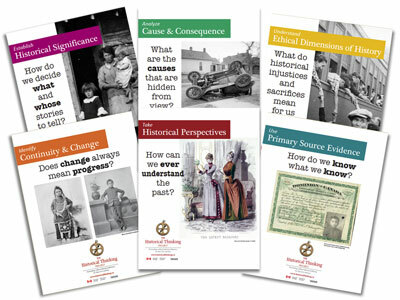 A set of six posters illustrating the Historical Thinking Concepts is available in English and in French. These posters can no longer be ordered from us directly, since our office is closing in March 2016. Instead, we are placing these posters into Public Domain so you can download a PDF version of each of the six posters and print them yourself. The full-size files are designed to be printed in 12 x 17” format.